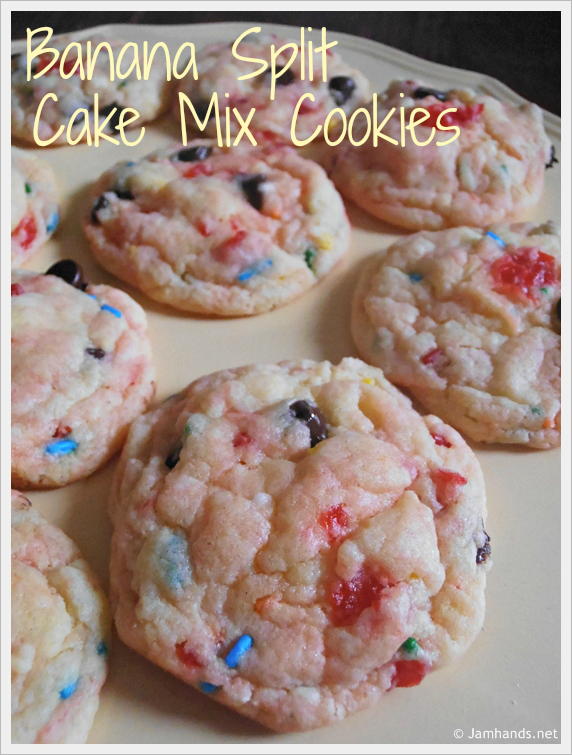 Have you made cake mix cookies before? I have a few times with pretty great results. Today I baked up these Banana Split Cake Mix Cookies which utilize a funfetti cake mix and a box of instant banana pudding. They turned out fantastic. I found this recipe at Taste and Tell, which has tons of great recipes to check out. Enjoy! 2. In a bowl, mix together the cake mix, pudding mix, oil and eggs. Stir in the chocolate chips. Gently fold in the cherries. 3. Form the dough into balls just larger than a walnut and place at least 2 inches apart on an ungreased baking sheet. Bake in the oven for about 10 minutes, or until set. Recipe from Taste and Tell. Sharing this recipe at the following fun link parties. How quick and easy! Love this idea. These are so cute!They would go great at a summer barbecue! These look awesome. Thanks for linking up at Chef's Day Off at chefnotincluded.com. Oh my goodness- these sound so fun and yumm! Thanks for sharing!